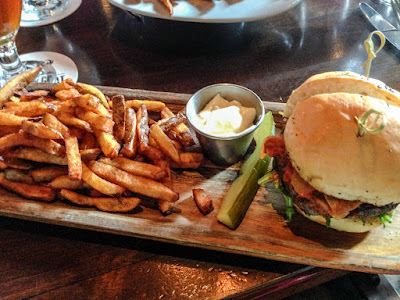 When in Canada, eat Canadian - right? So, we started the morning at Liscombe Lodge with fresh blueberry pancakes topped with real maple syrup. What a wonderful way to start a day. Then, the Good Girls and company returned to Halifax and the Westin Nova Scotian. Along the road, the mystical greenery was breathtaking, and someone shared this factoid: Nova Scotia is the largest exporter of Christmas trees, lobsters and blueberries. What a lovely trio! And, in case you're wondering exactly where Nova Scotia sits on the map:it’s a Canadian province on the east side of Maine and the name means New Scotland. 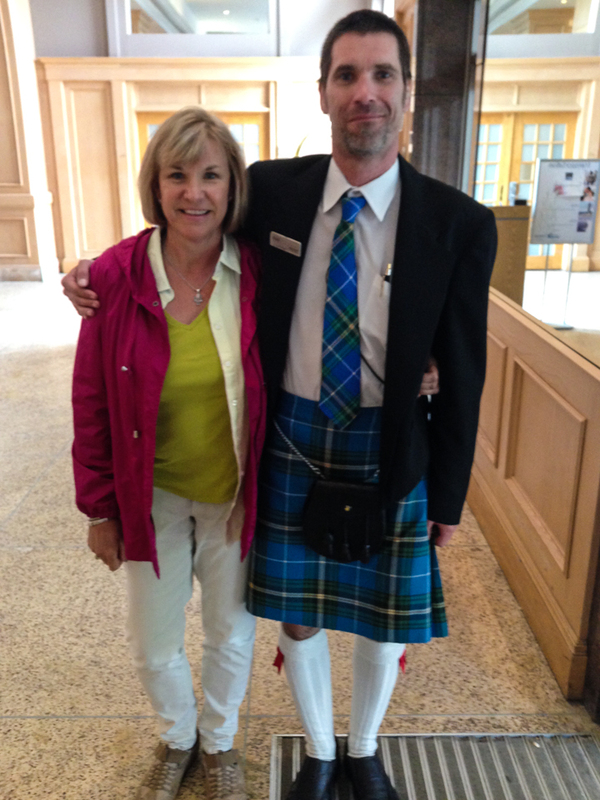 Hence, the reason we saw a few hotel workers in kilts. We checked into the Westin, which sits a stone's throw from the Halifax train station. In fact, there is a convenient connecting hallway. The hotel has a long history of hosting Royals like the Queen, Princess Diana and Prince Charles, Prime Ministers as well as other dignitaries and celebrities. Tonight they were hosting us for the hotel's 85th-anniversary celebration. While the hotel has not always belonged to the Westin group, it does retain much of its historical decor in the lobby. The guestrooms, however, are totally up to date, including the super comfy Heavenly beds. This hotel feels good; we both agree. The lodging meets the needs of any traveler with friendly customer service, clean surrounding and all the amenities you might want like room service, a gym (even workout clothes as part of the Westin Workout) and wifi. We made a point to have a drink at Roy's (Named for longtime-bartender Roy Clorey, who has worked at the hotel for 50 years and counting.) Lovely wine and vibe. The Good Girls are always on the move, and the group was soon off for lunch at the Stubborn Goat, a gastropub on Grafton Street, near the construction site of the new convention center. 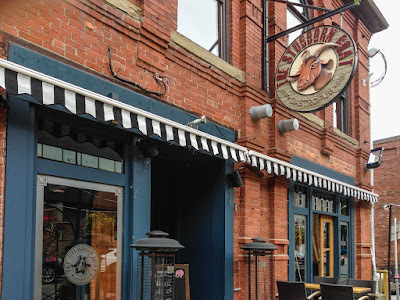 Their menu states their philosophy," To seek and find the best local products with which to create fulfilling comfort food, pour craft ales and libations made with thought and care, and serve all patrons as if they were guests in our home. It is our duty to have laughter, cheer and conversation thrive by offering a selection of small plates meant for sharing among friends and families who gather here." The Goat lived up to its promises. The highlight of the meal, at least for me, was something I've never eaten before - fiddleheads (ferns) cooked in a skillet with prosciutto, lemon, Gouda, almonds. 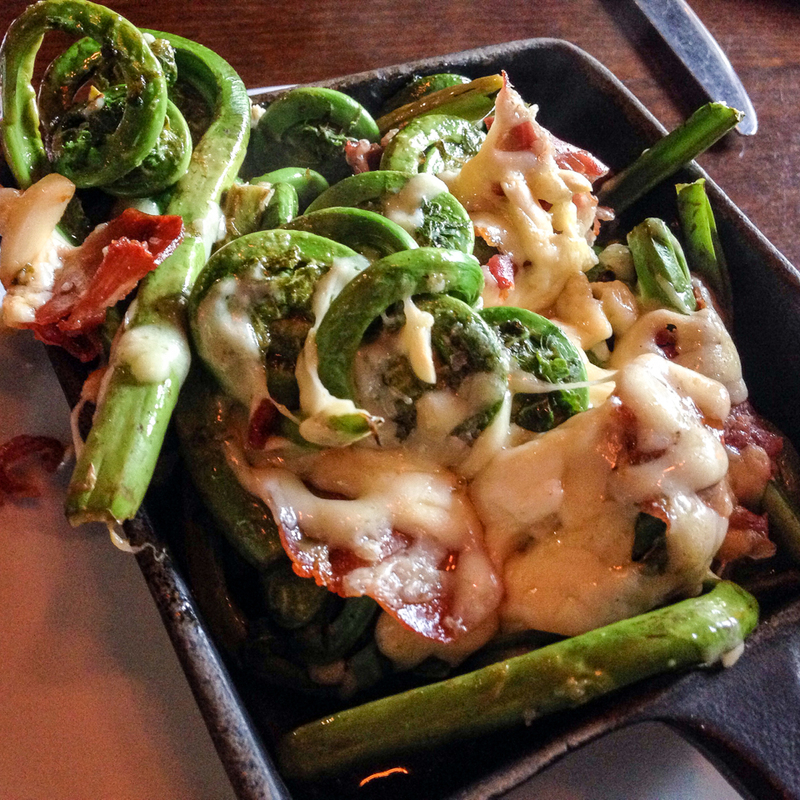 The flavors and textures tasted similar to green beans. Cheese held the dish together and the almonds added crunch. Quite delightful, I'd order it again. In a futile attempt to watch our waistlines, Judy and I split a Lamb Sirloin Burger with stewed tomato jam, roasted mushroom, arugula, grainy mustard and skipped dessert. Others raved about their woodstone oven baked pizza or lobster mac and cheese. Alas, we all left over-stuffed again. 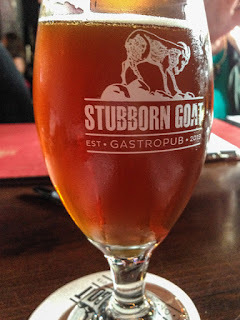 FYI- The owners of the Stubborn Goat first opened Durty Nelly’s, an authentic Irish Pub, which was designed and built in Ireland and shipped to Canada. The restaurant sports an elongated wooden bar and apparently is ‘ the place’ for listening to the Craic, what the Irish call storytelling and partying. I headed off to tour Alexander Keith's Brewery on the Waterfront while Judy hopped on the trolley tour. Keith's Brewery sits in a massive ironstone and granite building (c 1820). Actors in period costume take tour-goers back to Halifax in 1863. They employ song and story as they lead guests through the brewhouse and taproom. 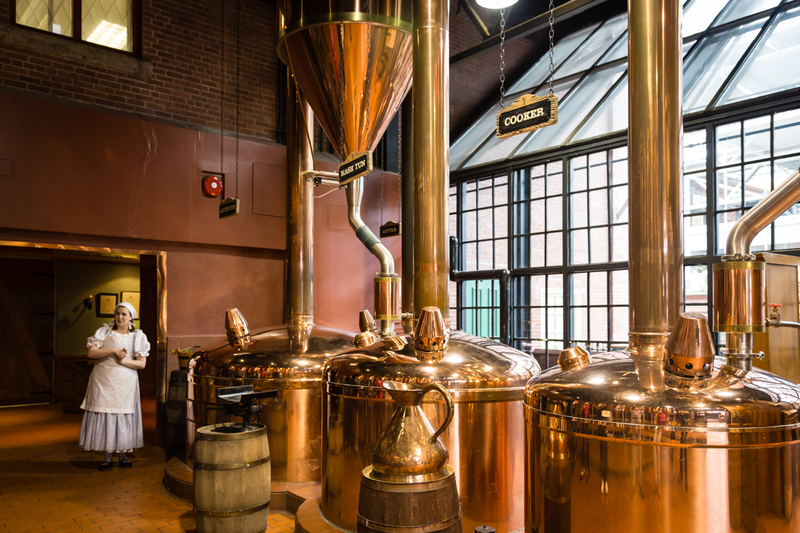 You enter Mr. Keith's original dining room and then follow into an over-sized production room with gleaming copper tanks. 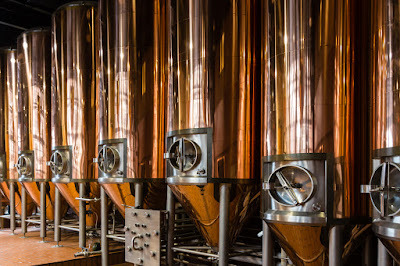 I have been on many brewery tours, but never encountered such magnificent apparatus. Let's just say I'm glad I don't have to polish all that copper. 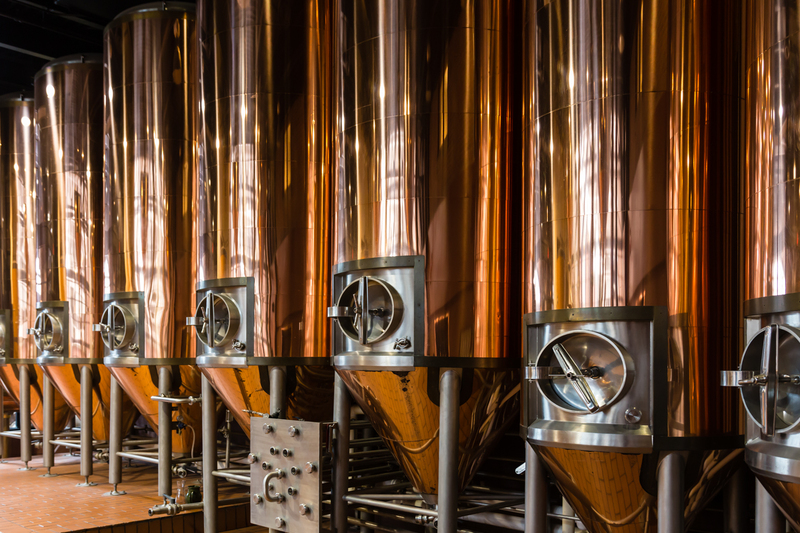 The tour doesn't dwell on the brewing process, which I appreciated as I've heard it over and over, and because the technicalities bore many. 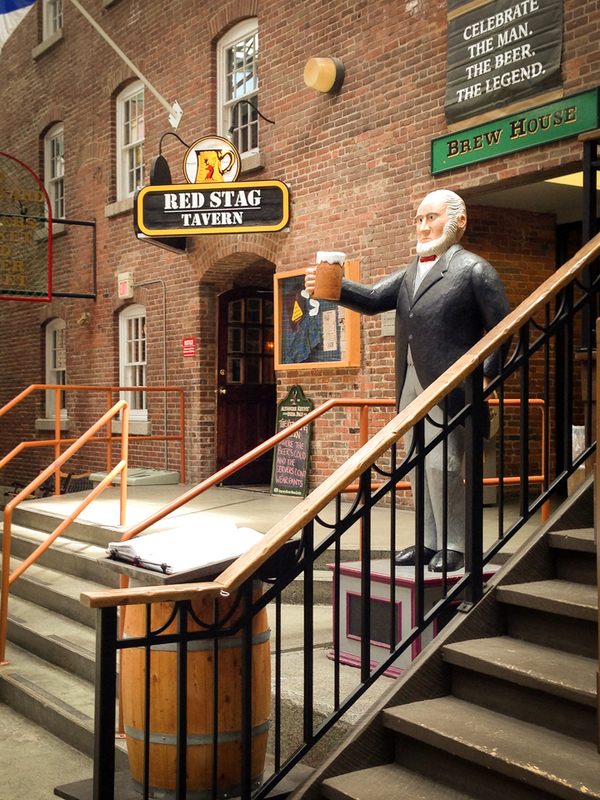 Instead, this tour heads right to an authentic old taproom where tasting and entertainment become the focus. Each participant of age receives a sample in a mug. I sat and enjoyed my choice, Keith's Red Amber, then joined in clapping to the tunes. 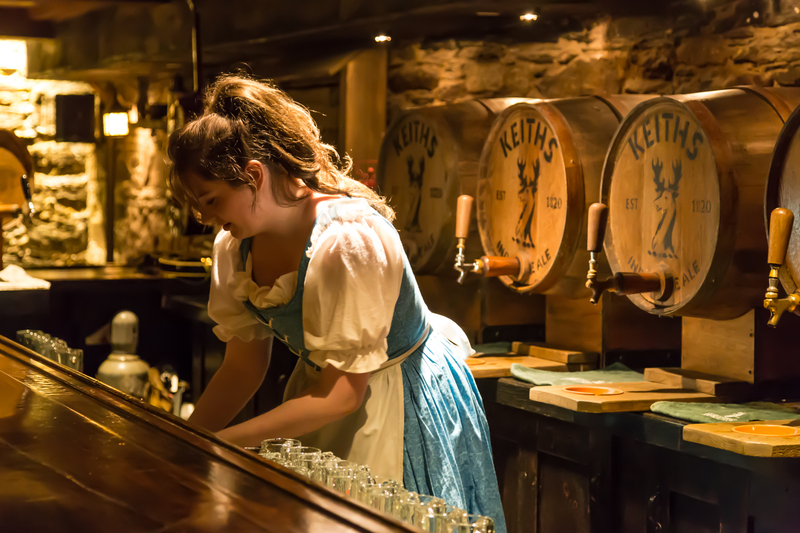 A few bar games were introduced before it was time to depart. I learned Halifax history in a most charming way and highly recommend this tour. 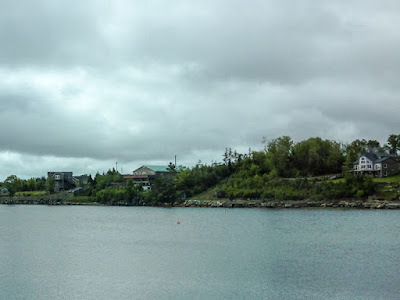 I did not have time to visit the fort-like Citadel National Historic Site, but on a 2010 visit, I made the effort and hiked to the highest point in the city. The Citadel, like the fort in my hometown St. Augustine, was built as a military fortification to protect the city from enemies and the occasional pirate. In Halifax, you hear the crack of rifle-fire and the haunting tones of bagpipes instead of canon fire. 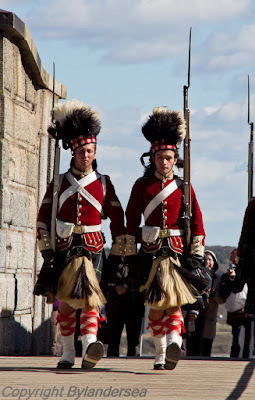 The Changing of the Guard, dressed in uniforms of the 78th Highlanders, creates a colorful and impressive ceremony. The Royal Artillery fires the Noon Gun every day – a Halifax tradition that is one of the oldest in the world. 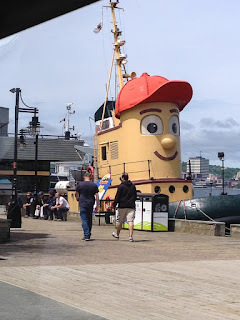 A short outing on Theodore Tugboat, stationed on the Waterfront, looked like fun and would likely be a highlight for families visiting Halifax. 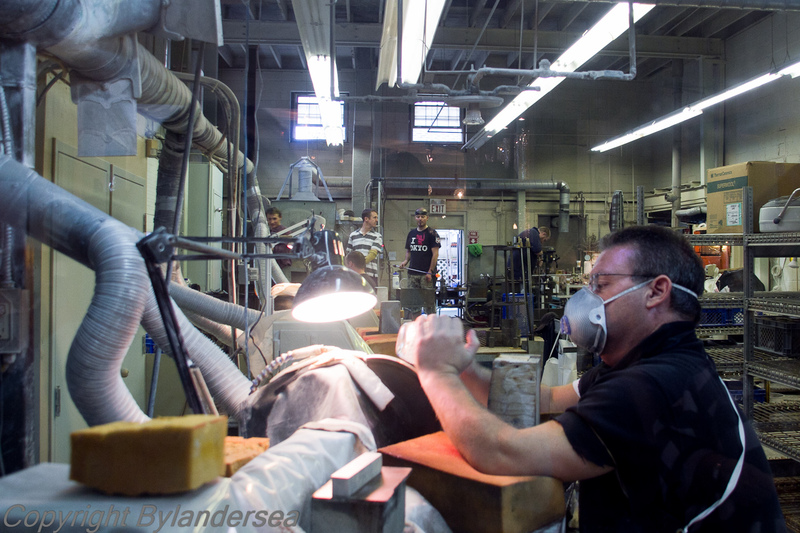 Worker handcrafting a vase at Nova Scotia Crystal. I also stopped in Nova Scotia Crystal where you watch glass objects being mouth blown, hand-cut and etched. 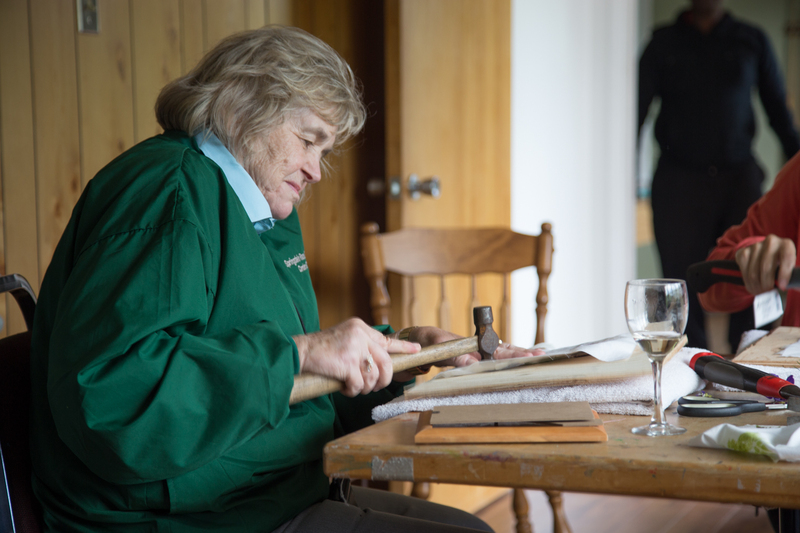 Irish artisans hoping to keep their craft alive opened the facility in 1996 and it remains the singular crystal manufacturer in Canada. The showroom is full of gorgeous pieces similar to Waterford crystal. They make lovely gifts and souvenirs. Like most destinations, it is the people and the history that bring out the true depth and beauty of what you see and experience. Halifax is certainly one of those places. Ready to cook. Photo by Debi Lander. 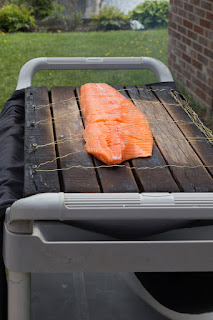 Having learned how to plank salmon, we figured how hard could boiling a lobster be, right? 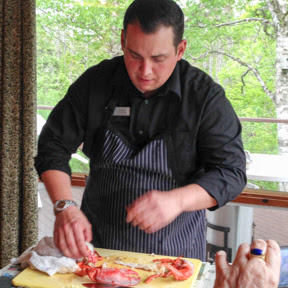 Right, with lobsterman and Liscombe Lodge Food and Beverage manager Ryan Hagen showing the way. Still, a lot to learn. Male or female? Females have the longer tails for carrying eggs. Females gestate for nine months but, lucky gals, can choose when during a two-year period they want to start. Males have the larger claws. Ah, those claws. One is the pincer, the other the crusher and you don’t want to be caught by either so pick a lobster up on its carapace behind and out of range of the claws. Lobster 101. Photo by Debi Lander. It takes these crustaceans seven years to mature and are best caught just after molting. Prices here vary with the size of the catch, $6.50 a pound if plentiful, $10 and up a pound if sparse. 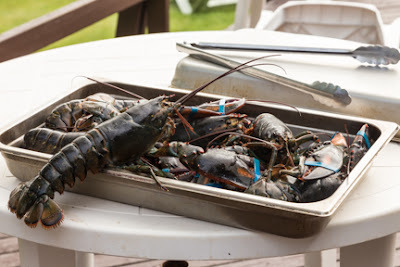 You can keep them alive in the fridge under wet newspaper for up to four days, but don’t ever eat a lobster that has died before hitting the boiling water. Ryan says lobsters don't feel pain, although who but the lobster knows for sure? They are very lethargic, cold water creatures by nature, so what is pain to us probably doesn't wake up until the lobster is already dead. 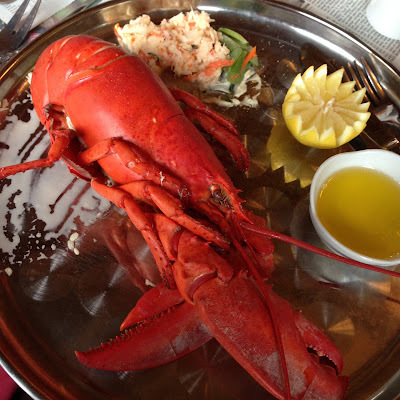 Think of the sensuous luxury of consuming that fresh, warm meat and let your lobster take the plunge. Remove the rubber bands from its claws first, says Ryan. 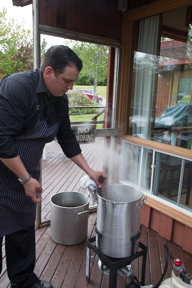 Ryan adds lobsters to the pot. Photo by Debi Lander. When cooking, figure 12 minutes at boiling per pound, with one quart of water per pound and one tablespoon of salt if not using seawater. But don’t count on it. Pull one of the antennae: if it comes out easily, lobster’s done. If not, keep boiling and steaming. Everyone from Newfoundland to Maine seems to have a secret additive: Add salt, add sugar, add whatever comes to mind, I guess. Tools for the lobster feast. Photo by Debi Lander. Let the cooked lobster cool a bit. Ryan dries off the lobster as it cools. Photo by Debi Lander. Twist or cut off then crack the claws with a nutcracker. Ryan shows off his cracking skills. Photo by Debi Lander. Take the walkers off. Toss the body. Take the tail in hand, stretch and squeeze it then twist the meat out. Don't forget the sweet meat inside the tail fan. Enjoy. Now it's our turn to work. Photo by Debi Lander. Lobster shells are good for compost and for keeping slugs out of the garden. Dry them in the sun and crush first. The golf balls used for driving practice on cruise ships are made from lobster shells. You only get 70 percent as much distance but they are biodegradable and isn't that a fitting circle of life? 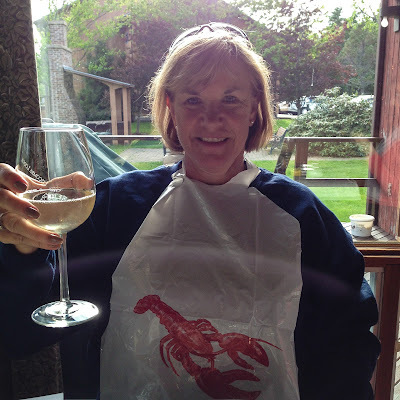 Debi salutes her lobster with a glass of good Grand Pre, L'Acadie Blanc. Photo by Judy Wells. 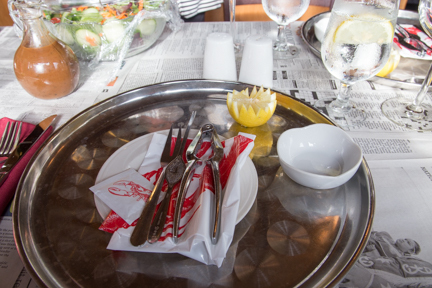 Don’t feel badly about depleting the lobster population. 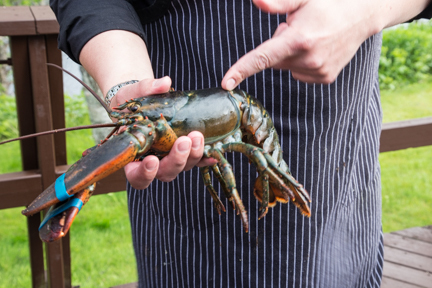 Clawed lobsters, the kind you find in cold water, are increasing in number thanks to stringent harvesting regulations in both Canada and the U.S.
Those humongous 10 or more pounders? Not good eating. Too old, too tough. The smaller 1 1/2 to 2 1/2 pounders are for best for eating. Excuse me now, please. Need to check the boiling lobster pot. 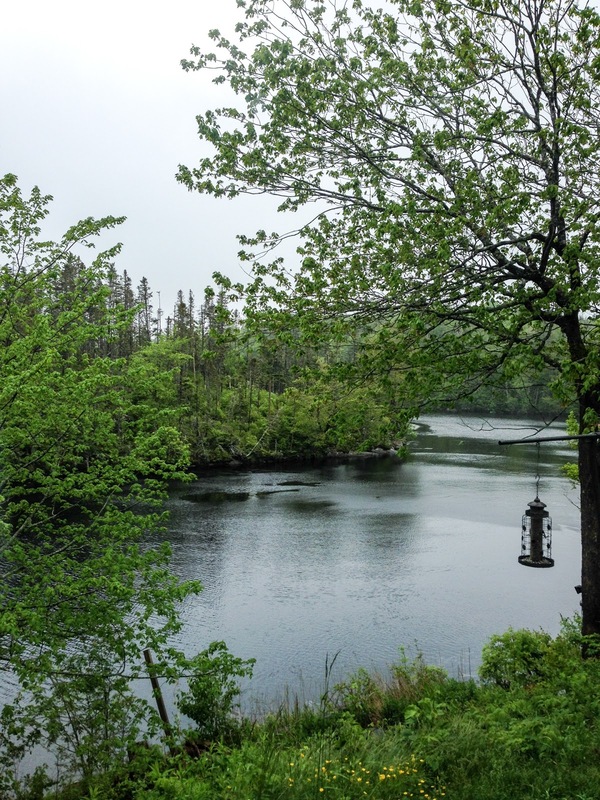 The drive from Halifax to Liscombe Lodge on Nova Scotia's Eastern Shore takes about two and a half hours. We arrived at Liscombe just in time for lunch, our first chance to taste some lobster and we weren't shy. We ordered seafood chowder and a lobster roll. The chowder arrived piping hot; a treat for Florida gals as it was a chilly, rainy day. Every spoonful warmed our bodies and souls. Next came the lobster roll and only one word is needed, "YUM." Lovely, large chunks of the cold-water crustacean with just a light touch of mayo on a home baked bread. After lunch, we checked into our rooms. They sat next door to each other: rustic little cabins, called chalets, with a big bed and a small wood-burning stove in the corner. The cabins, with outdoor verandas, overlooked a rapidly moving river. The swishing sounds would surely lure us to sleep at night. 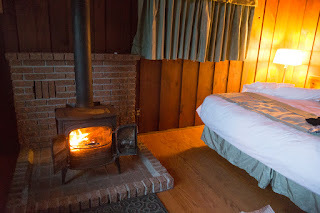 A warm fireplace in the evening. My Chalet near the roaring Liscombe River. 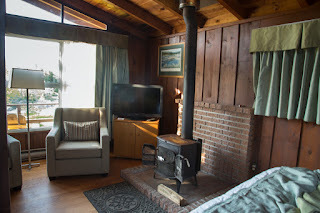 Interior of my bedroom in the chalet. 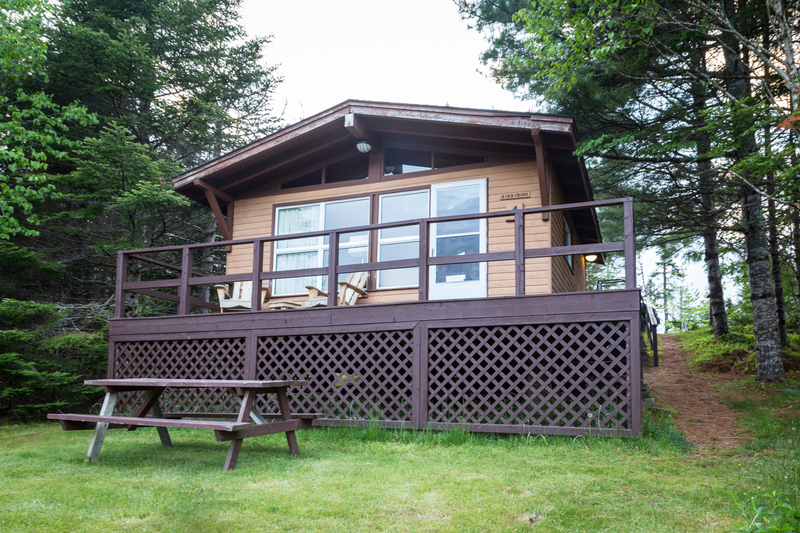 Liscombe Lodge offers 30 Riverside Lodge guestrooms, 17 chalets, and five four-bedroom cottages. They are pet-friendly and also have a fitness center and indoor heated pool. 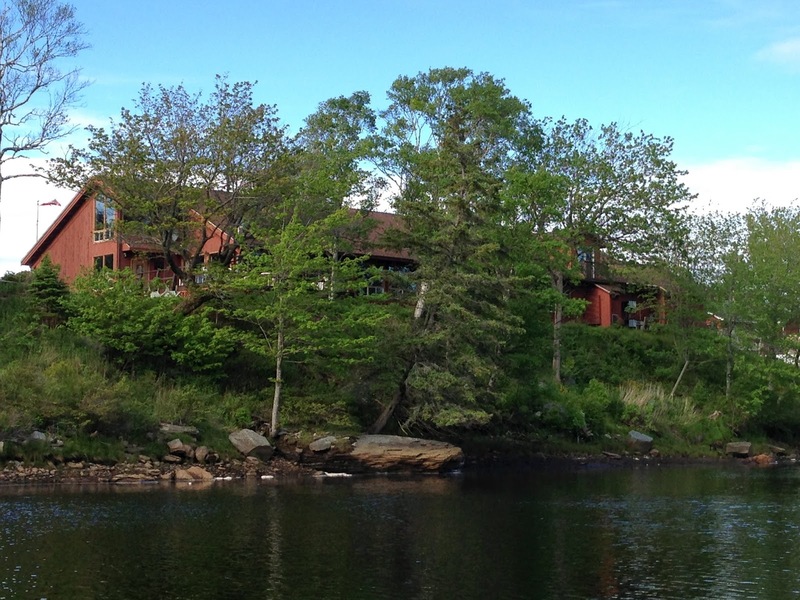 Of course, the main building includes a restaurant with big windowed walls that overlook the river. 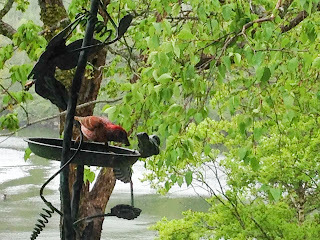 Many bird feeders hang outside the windows, and a bevy of colorful feathered friends come and go. We were thoroughly entertained by the little fellas. Birds outside the restaurant entertain diners. 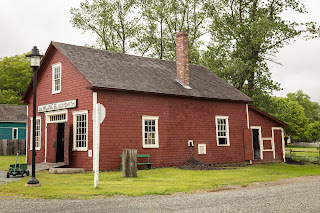 However, it was time to join two other travel writers and set off to Sherbrooke Village to experience life as it was along the St. Mary’s River before the 1900s. 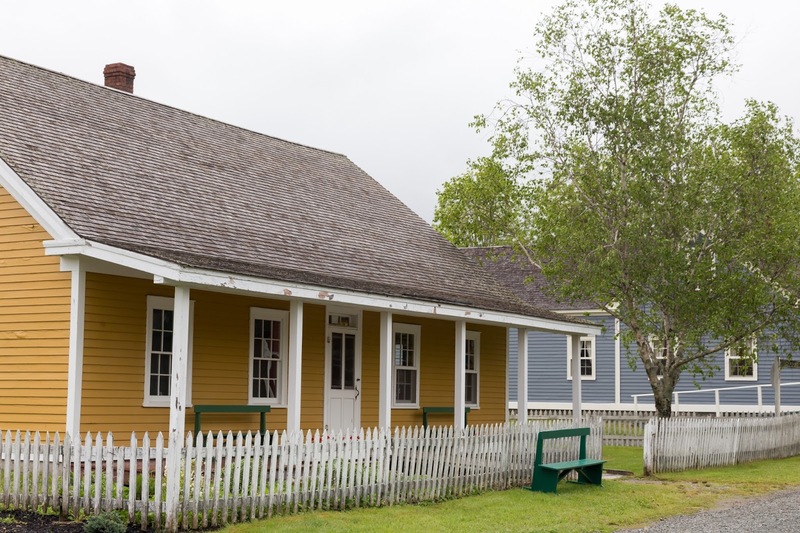 In the 1860s, timber, tall ships and gold brought prosperity to this area of Nova Scotia. 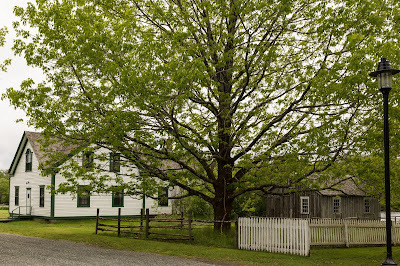 Today 25 original buildings remain where costumed interpreters bring history to life. We watched sparks fly from the blacksmith’s hammer as he created an "s" curved hook. 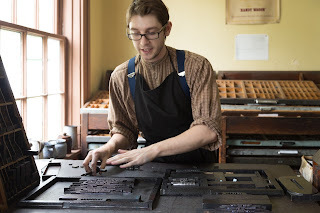 We saw the printer using his press and witnessed the work of a weaver’s nimble hands. 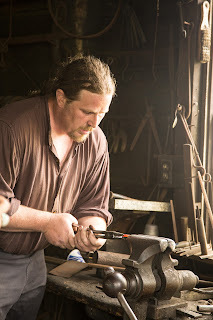 The Blacksmith at Sherbrooke Village. Our tour was far too brief; this is the type of place you need to spend the entire day roaming around. The Tea Room looked inviting, and the menu featured Fisherman's Pie and Old Fashioned Lemon Snow, a lemon pudding with custard sauce. Something the Good Girls would have surely devoured. We were impressed with the variety and number of hands-on workshops held there throughout the year: woodworking, forging, a sawmill and goldmine frolic, a songwriters camp, sewing circle, antique car show, a sporting day for traditional driving- as in horse and cart, a time traveler's reunion and harvest weekend. Sherbrooke Village reminds me of Sturbridge Village in New England, but it's a smaller version and covers a later period. Anyone touring Nova Scotia should consider stopping. We give it a thumbs up! 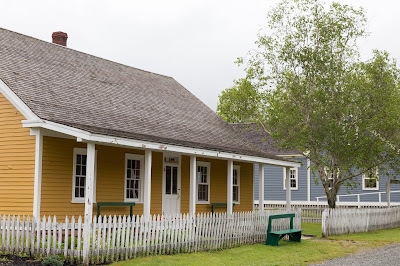 The lovely Sherbrooke Village in Nova Scotia. We returned to the Lodge for a salmon planking demonstration. The chefs mounted a wild salmon filet on a board, placed it near an open fire, and brushed with maple syrup and butter. 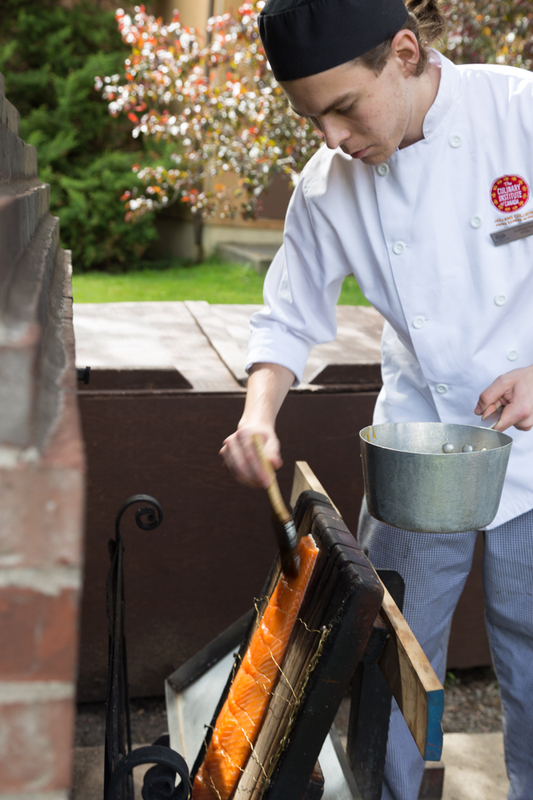 The cooks at Liscombe Lodge prepare this house specialty daily. Since we'd missed dinner the night before, we were ever so grateful to taste the Nova Scotia delicacy. Another yum! Brushing the glaze onto the salmon. Onward for a crafting project! 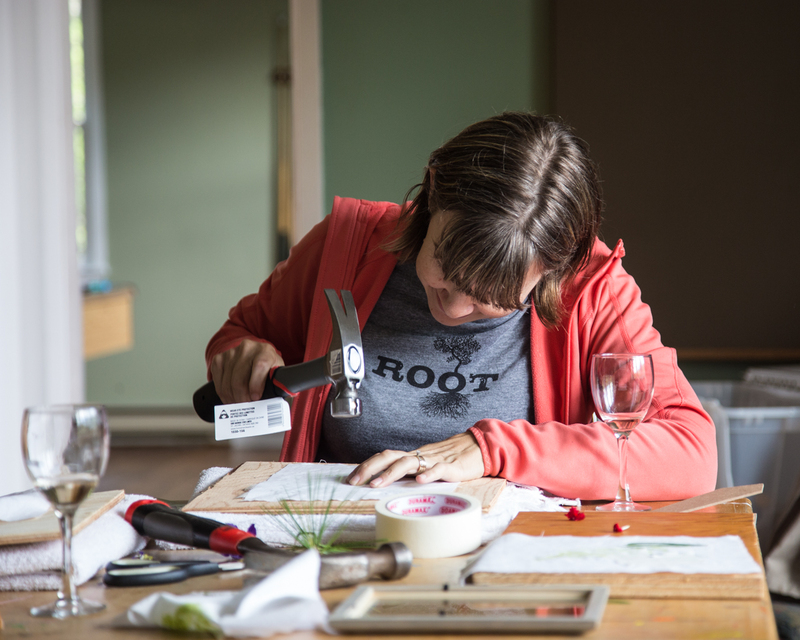 Generally, the Good Girls don't sit around working on crafty projects. We are too busy gallivanting around the world. But, when given the opportunity, we jumped- no, pounded in. 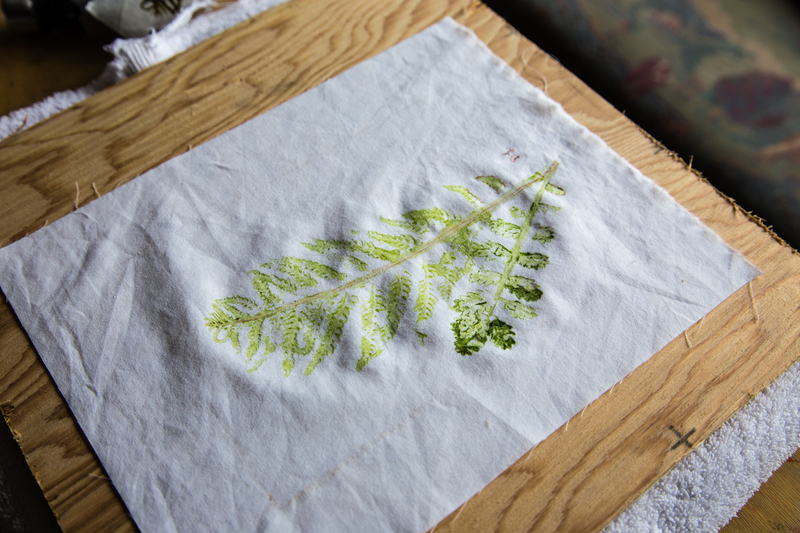 We were offered an array of wildflowers and plant leaves and were to create a print by hammering the natural oils through a piece of muslin. Oh yes, wine was included, too. Our friend Kirsten works on her craft project. and I stuck with a fern, a fiddlehead fern to be exact. This type of printmaking is one heck of a useful craft if you happen to be angry with someone -- just pound out your hostilities. We then ironed the fabric to affix the imprint and placed the design in a frame. Can't say mine is a work of art, but if my grandchild made it, I would have been thrilled. Nice to see the Lodge offering an activity that includes nature and keeps one busy. A perfect rainy day project. Since the misty weather curtailed a morning boat ride, we made up time with an afternoon outing. Liscombe maintains a marina and offers scenic tours on the water. The Good Girls, Debi Lander and Judy Wells. Our boat ride included hors d'oeuvres and wine, an event that placed the Good Girls back in their element. We motored across shimmering crystal clear water and through the noticeably clean air. We passed fifty shades of green trees and peaceful vistas. 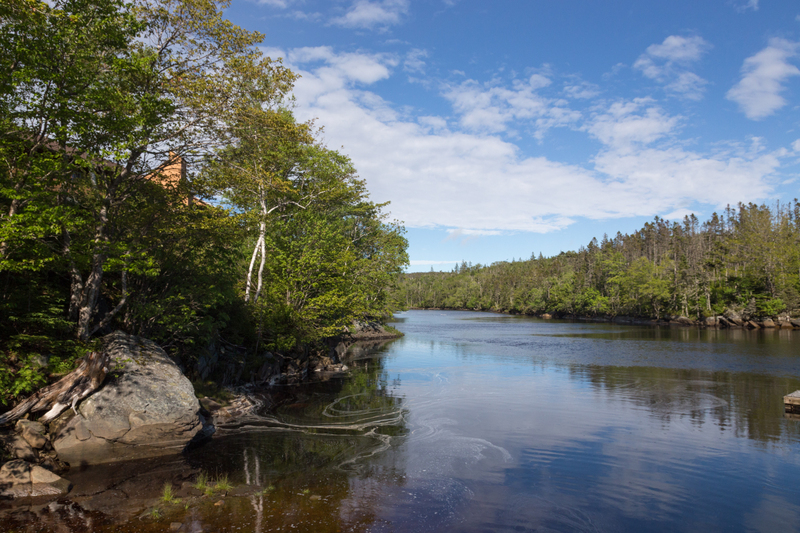 My goodness, the look of Nova Scotia is pleasing to the beholder. We loved the calming views. A Rainbow appeared during out boat ride. 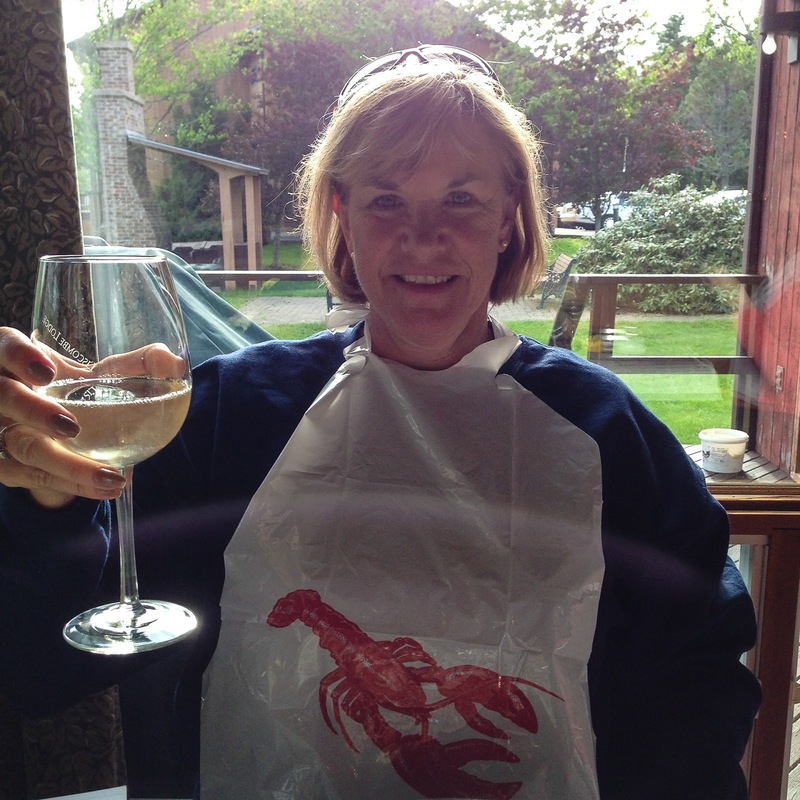 However wonderful the boat ride was, a lobster lesson and feast were next on the schedule for dinner. We didn't have long to wait. The Eastern shore of Nova Scotia is similar to the Puget Sound area. Photo © by Judy Wells. 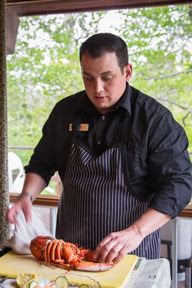 The drive from Halifax to Liscombe Lodge was a learning experience for this newcomer to Nova Scotia, thanks to our genial and well-informed driver, Jason Brown. The land reminds me of a flatter version – no snow-capped mountains or volcanoes – of Washington State’s Puget Sound. 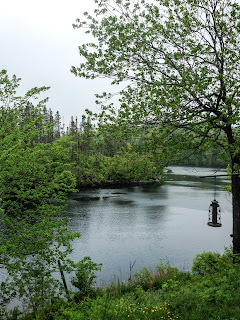 Roadsides are filled with evergreen trees through which you get glimpses then panoramas of lakes, sounds, inlets, bays, necks, rivers, streams and brooks. 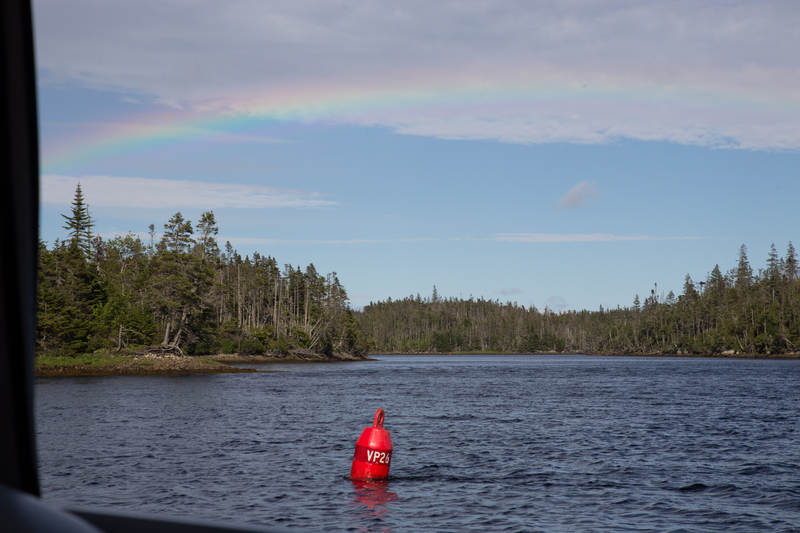 En route along the Eastern Coast of Nova Scotia. Photo by Debi Lander. Architecturally, houses bring New England fishing villages to mind with saltbox, cottage, four-square and the occasional Victorian house thrown in. Wood piles and lobster traps are stacked everywhere. Weather wise, like both, grey, misty, spitty and foggy with brief, very brief, glimpses of sky. Winter had come late and hard and spring is about a month behind the mid-Atlantic States. Rhododendrons, lupine and an assortment of wildflowers dot the greenswards. Rivers and streams rush from frequent rain. Instructive, also, was our education in pronunciation. Ecum Secum was EEK-uhm SEE kuhm. Barry Colpitts' house was a "must stop" spot. Photo © by Judy Wells. Debi Lander found a "ride" to try. Photo © by Judy Wells. Eager to reach the lodge where we should have slept last night, we resist the temptation to shout “Stop!” at every good photo-op. Until I spy the resplendent cottage and yard of folk artist Barry Colpitts. “I have to see this!” I yell. Amazing whirligigs and statues filled the yard with wonder and whimsy. 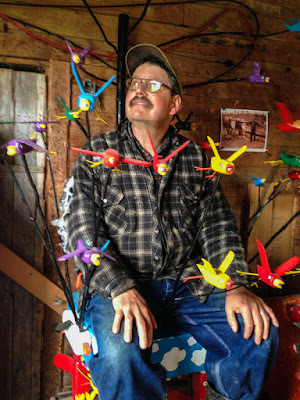 Brightly painted critters, sayings and images make the walls of his house a static theater. Life-sized Jesus, a woman walking a lobster on a leash, a pony-sized spotted cow with a bird perched on its tail that Debi tried it out. 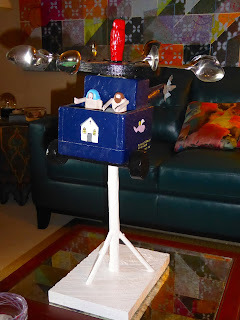 I had fallen in love with “Flying Slowly to Heaven,” a standing whirligig with spoons for wind catchers, Satan on top and Jesus driving a passenger below, when Barry comes ambling down from one of several workshop storage sheds. We introduce ourselves, express admiration for his work and learn he had been at the craft for more than 20 years. “You want to see more?” he asks. A tall, quiet man, Barry leads us up a hill behind his house. As each shed door is opened, more wonders appear. A fanciful bird chair, its brightly colored avians in twittery, flittery movement around Barry as he sits on the remarkable throne. Barry on the Bird Chair. Photo by Debi Lander. In another, standing figures – men, women, angels, Mounties – stand like multi-colored totems. Patriarchal figures with arms open emerge from what used to be oxen yokes. A standing spotted cow/pig-like critter with shark-like teeth glares. Barry shows us the "Hand-clap Dance. The Hand-clap Dance features jigging dancers that move as you clap spiked palms that radiate from the center pole. Finally, behind a door with a “Warning, cover your wife’s eyes” sign, is the Birdman. His head is an owl, his shoulders and torso geese. His feet are giant chicken legs and where a tiny chicken head is, well, you can imagine. “I usually plan these all out but I didn’t expect this,” Barry said, reddening ever so slightly. Not for sale. Nothing outside is for sale. Hard, never changing rule. Maybe. Maybe not. That’s the real wonder of genuine, impelled-by-an-unknown-force-to-create folk artists like Barry. 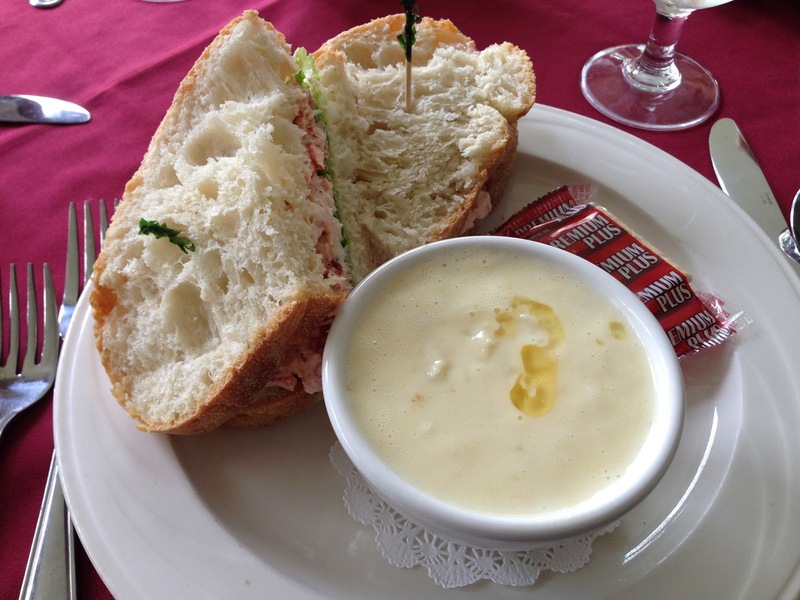 Lobster, chowder and soul-filled art. I like this place. ***POSTSCRIPT: After this was posted, I e-mailed Barry in care of Black Sheep Gallery (he doesn't have a computer and the gallery is nearby) and asked the owner if she would let him know how much we appreciated his work and hospitality. Thanking her for delivering the message, I added that if he ever changed his mind about "Flying" I really was interested. Several days later she replied and said Barry would sell it! 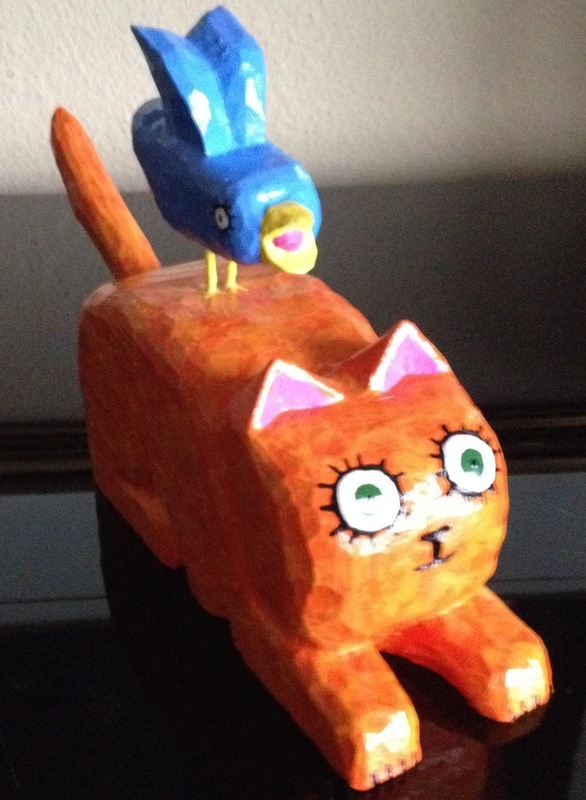 "Flying" now has pride of place on my coffee table.